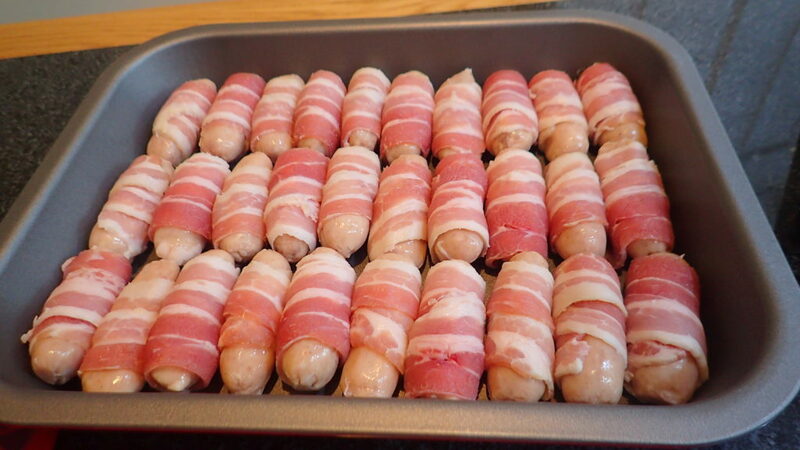 In the United Kingdom, “pigs in blankets” refers to small sausages (usually chipolatas) wrapped in bacon though in Scotland they are often called kilted soldiers. 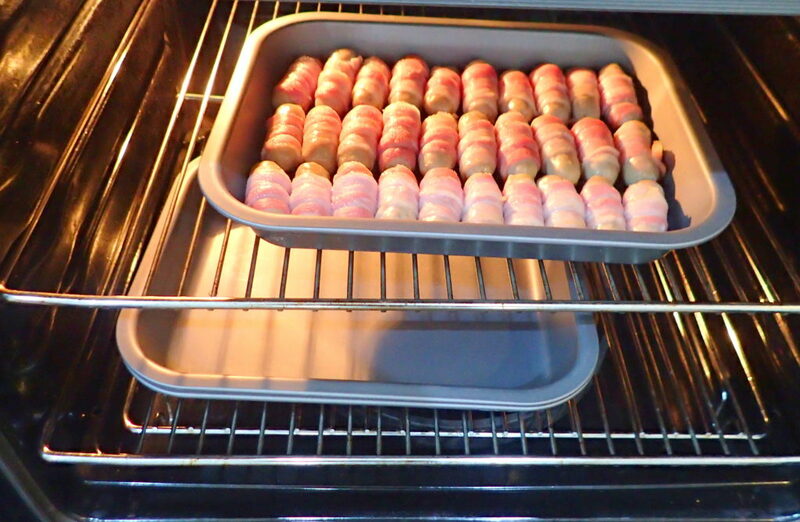 They are a traditional accompaniment to roast turkey in a Christmas dinner. 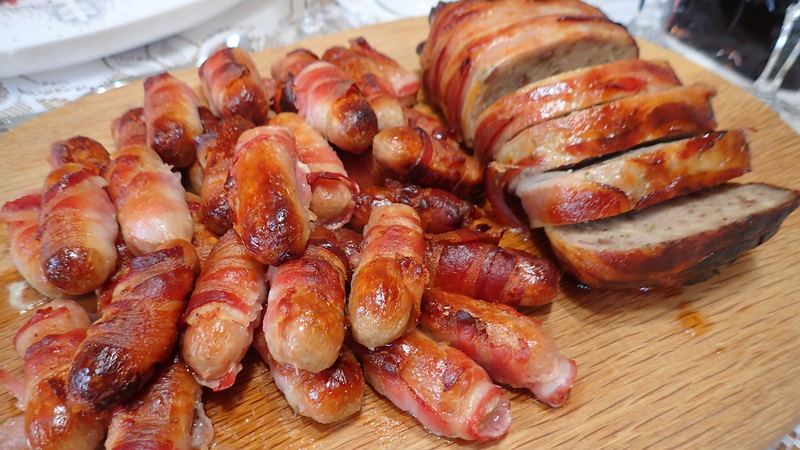 Pigs in blankets can be followed with devils on horseback, an appetiser of prunes wrapped in bacon. 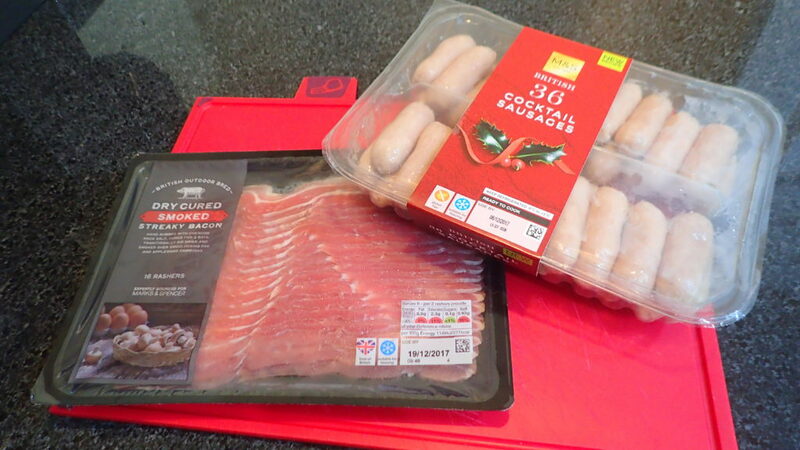 In my house there is never enough pigs in blankets. Some interesting read. The name can also refer to Czech-American dish, klobasnek. The German Würstchen im Schlafrock (“sausage in a dressing gown“) uses sausages wrapped in puff pastry or, more rarely, pancakes. 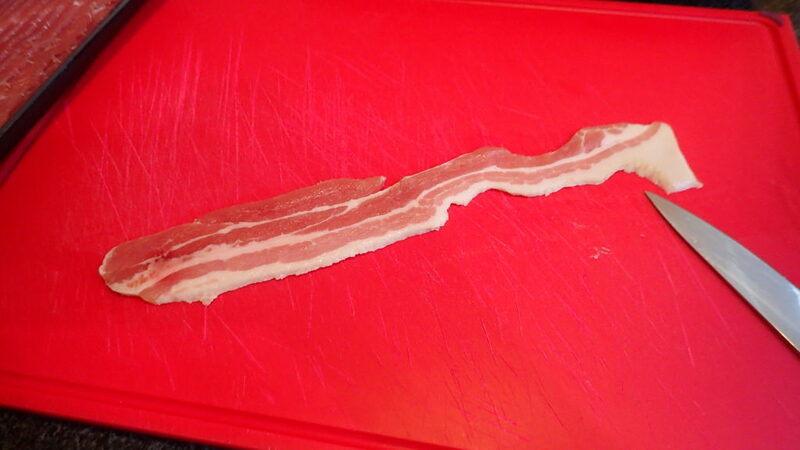 Cheese and bacon are sometimes present. In Russia, this dish is named Сосиска в тесте (Sosiska v teste, “sausage in dough“). In Israel, Moshe Ba’Teiva (Moses in the basket) is a children’s dish consisting of a hot dog rolled in a ketchup-covered sheet of puff pastry or phyllo dough and baked. In Denmark, there is a dish similar to the British-style dish known as the Pølse i svøb, which means “sausage in blanket”, usually sold at hot dog stands known as pølsevogn (sausage-wagons). 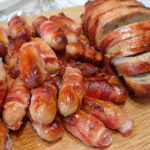 The American-style pigs in a blanket are known as Pølsehorn, meaning “Sausage horns”. 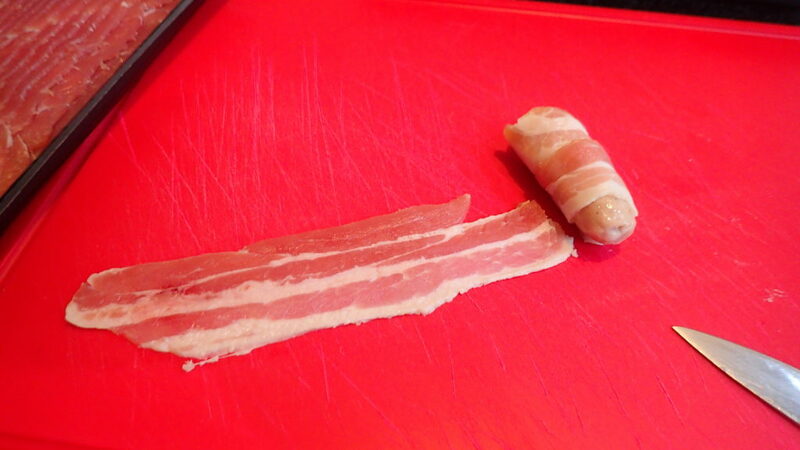 In Finland, pigs in blanket are known as nakkipiilo, which means “hidden sausage” if it is translated freely. In Mexico, the sausage is wrapped in a tortilla and deep fried in vegetable oil. The name “salchitaco” comes from the fusion of the ords salchicha (sausage) and taco(sausage taco). 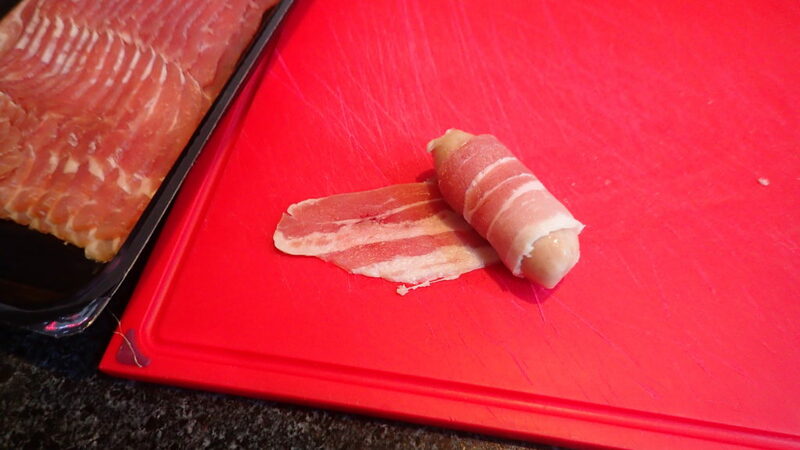 In both Australia and New Zealand, pig in a blanket is a cocktail frankfurter wrapped in bacon and/or puff pastry. In China, a Chinese sausage wrapped in pastry is called “Lap Cheong Bao” and is steamed rather than baked. In Hong Kong, a hot dog wrapped in pastry is called “Cheung Jai Bau” or “Hot Dog Bun” and is baked. In Estonia, they are referred to as “viineripirukas”, which means sausage pastry. In Serbia, the dish has a name “rol viršla”, lit. (hot) dog roll. Rol viršla is a very popular type of fast food in Serbia. 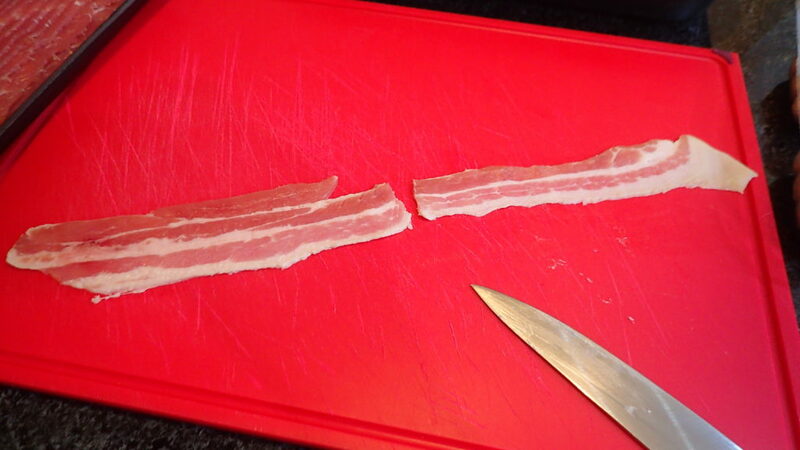 Place the bacon on a chopping board, then using the side of the knife, stretch and flatten the bacon until about half as long again. Roast for 20 minutes until golden-brown and cooked through.